The Penderwicks series is an example of how beautiful and complex Middle Grade novels can be. 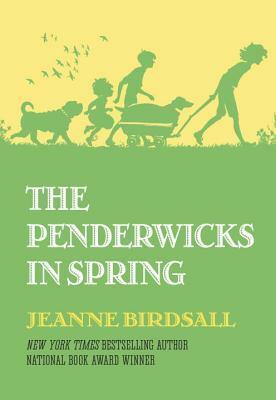 The Penderwicks in Spring is the fourth book in the series. It takes place quite a long time after the prior books. Batty, who was four in the first book, is now almost eleven. She is the central character of the book. The older girls Rosalind, Jane, and Skye are in college or the last years of high school. Rounding out the family is their step-brother Ben and their 2 year old half-sister Lydia. My main complaint about this series is that there is typically three years between each book. Obviously, my memory fades. Thankfully, it does come back quickly, but it took me awhile to reacquaint myself with the girls' personalities. Batty has grown into a lovely girl. She is painfully shy (something I didn't recall from the earlier books but surely I've just forgotten). She has a passion for music. In this novel, she discovers that she has a beautiful singing voice and has to battle between her love of music and fear of the spotlight. She is also mourning the death of her beloved dog, Hound, which made me sad because I fondly remember him from previous books. The book goes to some really deep places for a middle grade read. Batty is not only processing Hound's death, but also has to deal with the death of her mother (who died when she was a baby) in ways she never did before. We come to understand how the mom's death has profoundly affected the kids and their relationship with each other despite its long distance and their love for their stepmother Iantha. There is also a vivid and heart-breaking depiction of depression. It's hard to read the depths of despair that Batty reaches, but I think an important thing for young readers to understand. Boys are more a part of this book than the previous ones. Rosalind brings him a guy that everyone hates. Their neighbor Nick comes home from the military and is a stalwart young man that the entire family worships. Rosalind's ex-boyfriend Tommy also plays a small role. But Jeffrey - beloved Jeffrey - is the most significant boy. His unrequited love for Skye and her rejection of him have consequences for the entire family. I was really frustrated with Skye in this book. She was so selfish in alienating Jeffrey from the family, just because she didn't "like" him. I truly hope that The Penderwicks series is still in print in 100 years. It has the feel of my favorite classic children's books. In some ways, the plots of the books aren't that important. What's most enjoyable is experience life with the wonderful Penderwicks children. It is a happy place to be, even when there's a lot of sadness involved as with this book. Recommendation: Read it! The entire series! Required reading. The Penderwicks sounds sound amazing. How many books are in the series? Just two? or more? Please visit my blog and sign up for a chance to win a free giveaway, the Audie Award Winning audiobook of Egg and Spoon. I have never read this series, but it sounds like I should. Is this the final book in this series?